I have been an interior designer for 14 years, and an Airbnb hostess for 7. Since becoming a hostess, I also have used Aibnb and VRBO a fair amount for travel. One thing I have noticed is that when I am creating, or choosing a rental space, I am looking for really different things than when I am working with a client. With a clients home, I want to create a complicated visual story. Your room should be something that you can look at for a while, I want your eye to have something pretty to look at every place it wanders, and the room should tell the unfolding story of the family that lives there. Each detail about the home: the colors, the pieces of furniture, the accent pieces, the art, should reflect the history, interests and taste of the people that live in that home. They might love sailing on the Great Lakes, and want charts on the walls, they might have family member who create pottery, they might have lived in Asia. The challenge is creating a harmonious, comfortable whole room that still reflects all the complexity of real life. With a rental, it is much more important that the story of the room is clear the moment that you look at it. A vacation getaway should look clean, uncluttered and above all comfortable. The feeling of the space should have themes similar to the reason that the guest is visiting. You can assume there is something they like about that setting, that is why they chose to vacation there, instead of a million other places on the earth. They will be attracted to staying at a place that echos the location. If they are searching for a rental by the ocean, the space you are renting out should have some of the natural tones, and airiness of the beach. 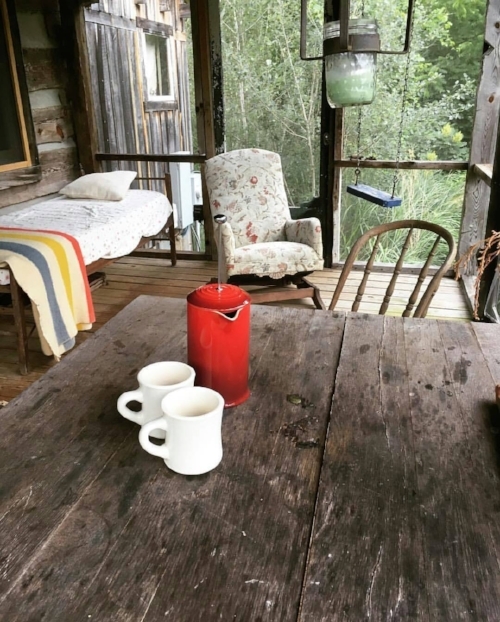 If you are choosing to go to the mountains, a vacation rental that echos the rocks, the woods, the rough hewn textures of a cabin might be what attracts your eye. I happen to live near a university, and host visiting scholars, often from the EU. Their rooms look cozy, with American quilts and books on our state and local history. I try to incorporate a place to sit with a laptop and get work done. When I am creating a rental space, the story is much more about simplicity, comfort and fun, echoing the vibe of the location, and enough open space for them to imagine making it their own. There are some things that are the same when designing any space. We try to think deeply about how the beautiful items in the space will help the function of the room. In a private home or in vacation home, people might want to; play board games, cook gourmet meals, share a bottle of wine, work on a laptop, socialize with a group, have a restful nap, work on a creative project, or read a book. We make sure that we know how you want to use the space, and then create an ideal room design makes sure that each of these activities can take place. Essentially, when you are designing any room you are attempting to give a person beauty, and make them comfortable in that space. The essential difference is that in a vacation rental, that guest is spending their days in relaxation, and your design should help create that feeling of being away from it all. I just spend a couple of days walking around at Design San Francisco, the Spring market for the San Francisco Design center, and was intrigued at how we seem to be at a transition point in design. Change is in the air in a lot of ways: color is changing, the influences are changing, and our industry is changing. Blush continues to look fresh as a soft accent color/neutral. I am not the most feminine colorist, I like strong and dark colors, but am enjoying other’s interiors that feature blush and coral. Navy and slate blue are both everywhere, used almost as a neutral to replace black and camel in neutral rooms. Yellow, tending to mustard, is a bright that continues into 2019. 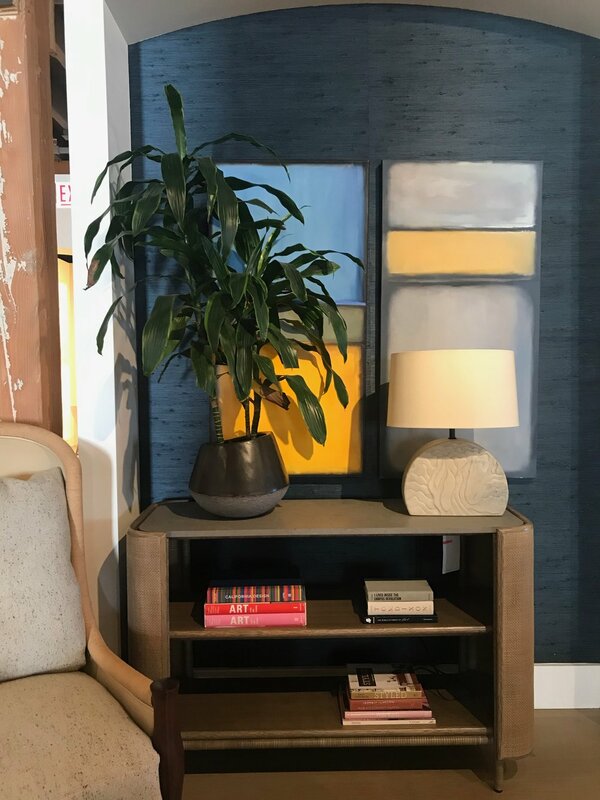 This color meshes well with the late 60s and ’70’s design inspiration, and with the strength of denim blues, from the Navy mentioned above, to the textural mid blues we were seeing everywhere in upholstery. Teal is a mini color trend, creating a retro ’80’s palette when combined with the blush pink and the brighter yellows. I feel like all of the neutral palette rooms are adding pops of color, and many rooms are going to strong colored palettes. The ‘70s vibe has, to a large extent, replaced the MCM inspiration that has been ubiquitous in past years. It still feels stylish, and has brought with it a new interest in rustic and muscular ceramic pieces, including in tiles. The textures are unrefined, and natural. Think palm trees in baskets, Indian block prints, dip glazed pots, Curtis Jere welded wall sculptures, and brutalist inspired wooden furniture. 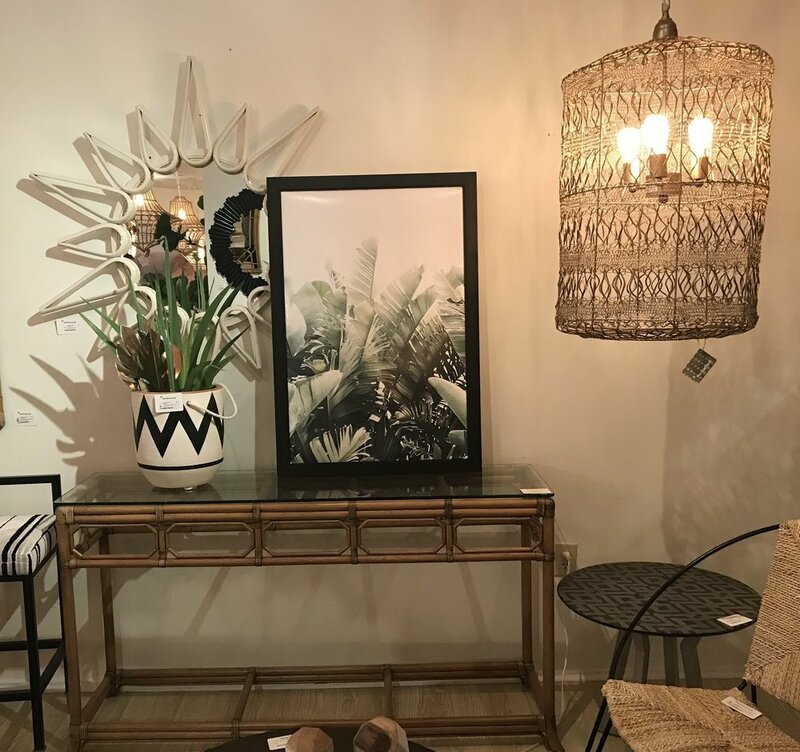 In the mass market it is expressed in the bohemian Bungalow style, and in high end design in wonderfully handcrafted textiles, ceramic work, and rattan and bamboo. Ethnic influences also are a component of this trend. I am excited to observe that Art Deco design is also big. This makes sense, because Art Deco was an influence on design back in the late 1970’s, so it pairs well with the ’70’s revival. In hardware and lighting gold and brass are still strong. LED light sources have changed the design of lights, as the the designers can fit the source of light into a ribbon, a wafer, or inside of a tiny space, as this LED lit block of crystal. Articulated lighting, both in wall sconces and chandeliers, also was a theme in the showrooms. Quality furniture is better for the environment, because it does not get discarded as quickly. It does not lose it’s paper thin veneer, the joints on the furniture do not get wobbly, and the upholstery does not wear out. You experience is better, because the best features of the items last- the seating remains comfortable, the fabric wears well, the drawers continue to function, you feel that you are touching a solid and valuable piece of furniture. I am so lucky to live close to such a wonderful furniture design center, it is truly inspiring to see the exquisite materials available. I often think that the average homeowner, even the design fans, have know idea how much beautiful product exists in the world. A wander through The San Francisco Design center is enlightening, and I enjoyed spotting the trends and changes in the market. High quality furnishings are more expensive than Overstock, West Elm, Wayfair or Pottery Barn. As consumers are watching home decorating shows, and shopping online, it becomes important for manufacturers and designers to be able to define and articulate what they bring to the table. I felt that there was a lot of conversation in showrooms, and amongst designers during this market week about the definition of value of design professionals and showroom quality furniture. The two significant characteristics that showroom furniture brings to design are encapsulated for me in two concepts: Quality and unique beauty. I definitely pour my heart out every time I write something, I am too old and stubborn to present anything other than my authentic thoughts. However that does mean that it is nerve wracking putting articles out there. We all have a little voice in our head telling us that we are unqualified imposters, and that noone is interested in what we have to say. (what, you don't? Lucky.) Anne Lamott calls it radio station KFKD, in her wonderful book "Bird by Bird", and says we just have to turn the volume down. 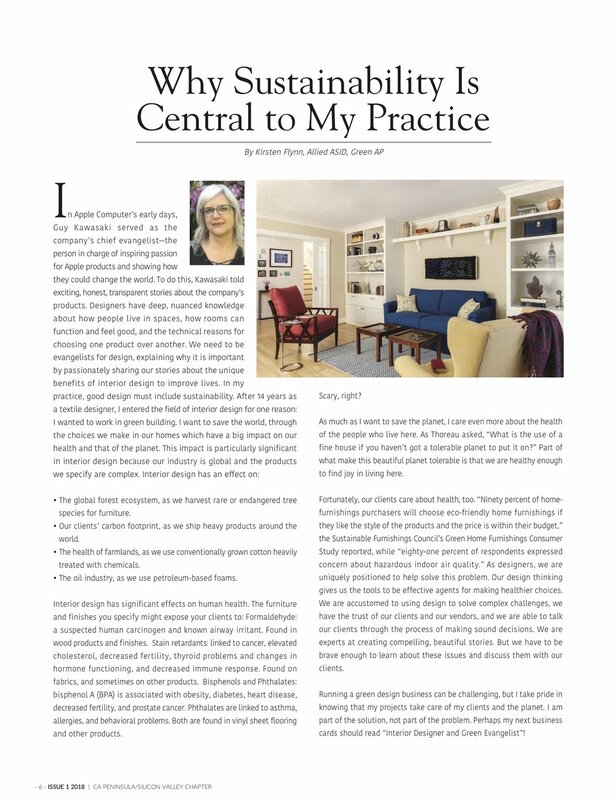 But there was a moment when I wanted to say no when the communications chair of my local ASID branch, Dolores Ayala, asked me to write an article about my practice. But I also am brave enough to just go for it! So with the help of the wonderful editors over at Lane Editorial- (thanks Betsy) Please enjoy the following article about why I feel so strongly that my business must be sustainable. Wood is good, what wood is best? Therefore one of our jobs as a green interior designer, is getting people to make environmentally sensitive choices in their interior design and furnishings purchases, and explaining clearly what ARE good choices. Luckily we have some great partners in making those choices clear. I have written about the Sustainable Furnishings council and their #GetYourGreenOn contest previously, and was lucky enough to win last year. They work to educate both manufacturers and consumers on making green choices. One of their biggest goals is to educate the furniture industry on how they can do better in sourcing the raw materials used in furniture. It is not a huge surprise that most furniture is made with wood. Making sure the wood in furniture is ethically sourced is especially important considering that the furnishings industry ranks as the third largest consumer of wood after the construction and paper industries. Furniture also is a large consumer of the beautiful exotic hardwoods, which are more likely to be poached out of a natural forest than construction wood. Mitchell Gold + Bob Williams are one of the top 7 scorers on the Wood Furniture Scorecard. The SFC has launched a new wood score card, in partnership with the National Wildlife Federation. The Wood Furniture Scorecard was developed to promote good forest management, based on an understanding that the furniture industry might, knowingly or not, be using illegally logged and otherwise unsustainably produced wood within their complex supply chains. It assesses wood sourcing policies for over 50 of the largest furniture retailers in North America. Published on a dedicated website, the scorecard covers publicly available information on how companies source virgin wood. It also evaluates company use of recycled and reclaimed wood. So check out the Wood Furniture Score Card, it is a good source of information. And consider patronizing only those retailers that are making a strong effort to do the right thing. Knowledge makes it easier to make good, responsible choices. A couple of discoveries from High Point! High Point Mart is the largest furniture show in the world, and it is overwhelming for the first time visitor. They have 11,000 square feet of showrooms in 180 buildings with 2000 exhibitors. Who knew there were that many vendors of furniture, rugs, pillows, antiques, accessories, and bedding. Blessings upon the Sustainable Furnishings Council for having this wonderful Guide to the mart, that shows where it's member companies are located. Even so, I saw less than 1/2 of their member showrooms, I definately will plan on going back. I am happy to have made contact with some of these vendors, and I hope to work with them in the future, to deliver healthy, sustainable furnishings to my clients. Jaipur Living make rugs, pillows and poufs. They are very open to using fibers that are sustainable, made from recycled plastic bottles, recycled Saris or Blue jeans, or Jute, which is one of the most sustainable plant fibers. I love this Jute and Blue jeans rug for it's quiet, almost neutral texture. Selamat Designs is one of the showrooms that I was super excited to find. They make furniture out of rapidly renewable materials, and sustainably sourced woods. They are riding the Boho Chic wave, which I love, but many of their solid Rattan pieces are timeless and useful for a traditional or modern interior. I love their Ambrose Banquette, and not just for the fabulous green color. Furniture that delivers a sense of enclosure is wonderful to use in larger rooms, when you might need to float some pieces in the room. This would look great from the back or the front. I did squeeze in a visit to one of my favorite vendors, Gat Creek. If you have followed my blog for any time at all you know that I consider quality to be one of the most important characteristics of sustainability. If your furniture ends up in the landfill after 4 years, it is not sustainable, you are just making ecologically sourced trash. Gat Creek makes quality solid wood furniture, out of sustainably sourced wood, while tracking all of their waste and energy use, and striving to be the best and fairest employer they can be. And, BONUS, I met Gat! Altogether a wonderful (if overwhelming) furniture mart. As a business leader I am concerned about the health of our world - my employees, customers, communities, and the global environment. I am committed to reducing the use of chemicals that pose harm to human health and the environment. As a first step, I commit to ask my suppliers about the presence of the following chemicals of concern in the products that we produce, specify or purchase: flame retardant chemicals, fluorinated stain treatments, antimicrobials, vinyl and VOCsincluding formaldehyde. Despite the size of the challenge, the SFC works to educate consumers, reward companies who do the right thing, and research what changes in furniture manufacturing make the most impactful changes in human health and environmental preservation. So you can see why I was excited to win for in SFC's Get Your Green On contest in "Shared Spaces" catagory with my family room project. I deeply researched the individual materials in each of the items of furniture used in this home, and I feel confident that they are some of the healthiest couches, chairs, tables and cabinets around. I like his houses, because his has really explored two interesting areas deeply. He clearly has thought about what functions take place in a home, and how to make space for those functions in his designs. If you do not design the space for the tasks/hobbies/interests that a client needs, they will end up feeling that their space is too small. This is not actually because their space is not the right size, but because it does not do the things that they need it to do. In the video linked above, Jay mentions that he designed a folding bulletin board system, so he could pin up current projects and look at them. He clearly needed to see things laid out when he is designing his projects, and if his house design did not include space for that to happen, he would not have been happy in his home. If you need it, if it makes your heart happy, make room for it in your home, however small. The second thing he has explored is the way that home design details make people feel at home in a building. Whether you love modern design, traditional or eclectic design, it is the details of a home that make a difference and make that home feel right for you. Jay's houses have details like porches, beautifully proportioned windows, and woodwork detail, that make the small spaces feel luxurious. I know myself well enough to know that I could not live in 200 sf, my design books and wind up toy collection alone, demand a little more space. However the lesson of the tiny house is that we should know WHY we want things in our home, and WHAT is truly important. If you do not love it, if it is not improving your life, perhaps it does not need you to make space for it. Sustainable Home is pleased to have been awarded two 2017 Design Excellence Awards from the American Society of Interior Designers (ASID) California Peninsula Chapter. Founded in 1975, ASID is the oldest, largest and leading professional organization for interior designers. The American Society of Interior Designers is a community of people — designers, industry representatives, educators and students — committed to interior design. The ASID CA Peninsula Design Awards Competition is a prestigious award bestowed upon the most talented designers in the CA Peninsula Chapter. This award recognizes interior designers for their hard work, making their designs the benchmark of the industry, and inspiring a new generation of students and emerging professionals. Kirsten was presented with these Awards at the Design Awards Celebration in July. Her winning projects were published this month in LUXE INTERIORS + DESIGN Magazine, September/October issue. We are so grateful to our clients, contractors and vendors for trusting us with the important work of making homes beautiful, functional and healthy. I recently had to renew one of my advertising contracts (yes please click through and see me on Houzz, but come back and read my blog) And you know what? It was kind of scary, it was one of the biggest yearly investments for my small business, and it was a lot of money. Think: more- than-one-piece-of-furniture money. But what helped me make that decision were the many thoughts I was having about why I love being an interior designer. There are so many reasons that this job is perfect for me. I love people, and truly believe that they are happier when they are in a well designed space. I love having the green knowledge that will make the spaces I design healthier for the occupants, and have a lighter footprint on the planet. I have always been most comfortable doing both technical and design thinking, and I get to use both my left and right brain solving the technical aspects of design and construction. But the biggest reasons are partially selfish. Design helps me be a better person, more the person that I want to be. I am extremely, almost obsessively visual. I love when the stream of images coming in my eyes stops the multiple layers of chat going on inside my head (and on my iPhone.) When something says to me “Look, this is beautiful, just look” I think that this feeling, of being in the flow of beauty, is why many people visit museums, or hike the high Sierra, or visit gardens. They want to experience being taken out of themselves by beauty. I actually get to create this feeling in my work, for my self, and hopefully for my clients. However, in order to do so, I have to pay close attention to so many things about the world around me. I have to truly enter into seeing. Is the mix of tiles I am using all matte, does a space need some gleaming surface to make it balanced? The client says she likes exotic feeling fabrics and rugs, what does that mean to her, and what exact rug would set the right note? When I find the right thing for a client, I often tell them that it just clicked. But I don’t tell them that is feels like a physical thing, like a puzzle piece sliding into just the right space with a smooth snap. The right thing just feels happier and more relaxed visually, than the wrong thing. Doing design helps me be in the visual moment, to spend time just floating on the stream of beauty. I also really want to be a kind person, and working as a designer helps me strive towards that goal. The spaces I work are not mine. They belong to the client, and at the end of the day, I walk away, and the client closes the door behind me and sits down in their home. Talking to clients helps me enter into their concerns, their preferences, their way of living and perhaps even their dreams. I have the visual vocabulary, the contacts with craftspersons, the textile knowledge, and the training in design, but the vision is theirs. Everyone has a different image in their head when they talk about their perfect home, and my hope is that by listening carefully and empathically enough, I can make that image real. And the flat out truth is that my business runs better when I am gracious. Interior design is always a collaboration, I am not an expert in installing glass tile, in duel fuel ovens, in faux painting, in cabinet construction or in looped carpet manufacturing techniques. But I know one! And if I am gracious, and a good learner, then I get to collaborate with all of these experts, as well as with my client, to create something that is beautiful and functional. Aristotle said “we are what we repeatedly do” and I am certainly going to continue spending long hours running my business. I am lucky that these hours involve some much time doing things that make me improve as a human being. I just happened to be over at Anthropologie, and notice that they are carrying the Plover Organic sheet sets. I enjoy Plover Organics for several reasons. One is that they are block printed. This is the technique often used in indian textiles where an interlocking block is loaded with ink, and then pressed down into the fabric. Because each block is hand inked and hand set, the result (usually a geometric repeating design) is delightfully varied over the surface of the textile. Often it will take several blocks to print all of the colors in the design. The Plover sheets are also organic, so you know you are doing the right thing. Did you know that 10% of all the pesticides used in the United States are used on the cotton crop? Also it takes 1/4 pound of synthetic fertilizer to grow one pound of cotton, which is about enough to make one tee shirt. So buying organic does make a difference. They are great quality with 300 threads per inch. Many of these sheets are on sale right now! So if you need sheets, it is bargain time. If you are a fan of color, (DUH, who isn't) you also should know about Amy Butler. 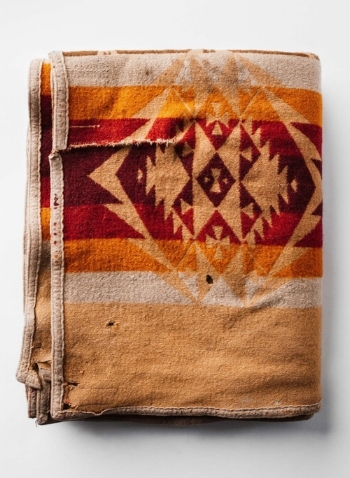 She makes a bunch of products, including sheets, and gorgeous organic towels. Her stuff is usually available at Bed Bath and Beyond, online. When should I be afraid of Fabric? I spent my early career as a textile designer, and love textiles. 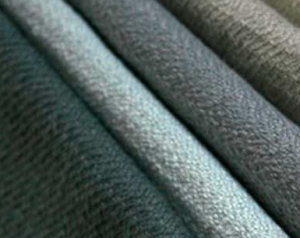 But like any modern manufactured product, fabrics are a complex substance with many inputs. The reality is that there are a lot of chemical inputs that might be unhealthy, but it is challenging assessing the level of exposure/risk that is appropriate for you. I often use conventional materials in my interior design process, but it is important to know what the major areas of concern are, and how to evaluate them. I also am a fairly relaxed person (despite all my specialized scary knowledge) and think that the goal should be minimizing exposure. It is impossible to eliminate all chemicals in our lives, but it is sensible to know when you are being exposed to those substances that raise the most concern among scientists. I recently had a chance to do some research about the various chemical components of fabric manufacturing. Green Home Guide has me write answers their Ask A Pro section of their excellen web site, and someone wrote in with a question about quilting fabrics. I have copied my answer below, but the bottom line for me continues to be the same: be informed about the component parts of the products you are bringing into your home, and use your best judgement to select the least toxic, the most natural, product that meets your functional design needs. I really wish I could answer yes to this question, because sourcing truly healthy fabrics is one of the more frustrating things I have to do in my practice. However, the answer is more complex. The very short answer is that washing does eliminate some of the toxins, but absolutely cannot eliminate all. It is very possible to get chemical free fabrics, the most dependable standard for healthy fabric is to look for fabrics, and not just yarns, that are organically grown and GOTS certified. GOTS stands for Global Organic Textile Standard, and examines at the chemical inputs into the fabric creation process, rather than whether that cotton was grown organically. Organically grown cotton is not sprayed during the growing process. There are many charming quilt fabrics that are both organic and GOTS certified. I love the fabrics by Harmony Art and that Modern Organic Fabrics stock. Harmony Art also has a list of retailers that carry her fabrics, and each of these stores carries other lines that are GOTS certified. It is important to ask for each fabric, because retailers also carry Oeko-Tex 100 certified fabrics, which are not as carefully monitored as far as the inputs. They are cleaner to use, but the production chemicals end up in the environment. In order to understand the chemical inputs Patty Grossman, of O EcoTextiles, helped me look at the steps of cotton fabric production. - As the cotton is grown it is sprayed with chemical pesticides, defoliants, and weed killers. The average acre of American cotton receives 4.3 pounds of pesticides. Cotton that is not labeled organic also could be grown from GMO seeds, seeds that have their genetic make up changed to make it resistant to herbicides. Studies have shown that pesticides are present inside the cotton fibers after harvest, and that they cannot be washed out using a home washing machine - As the cotton fibers are processed into yarns, and woven into fabric, they are washed, treated for texture, and bleached or brightened. These chemicals, often including dioxins, can be present in the finished textile. - The woven textile is dyed or printed to give it the color, and often treated for softness, wrinkle resistance, or other qualities. Printed textiles often have both heavy metals (such as cadmium) and plasticizers (like phthalates) in their printing inks. Wrinkle or stain resistant fabrics can contain chemicals such as formaldehyde. And these treatments and colorants are well designed by the chemists. They are designed to NOT wash out. The dyes, for instance, are called “fiber reactive” dyes because they chemically bind with the fiber molecules in order to remain colorfast. The chemical components of your fabric dye are there as long as the color is there. -In the home furnishings industry fabrics are often coated for stain resistance, back coated to give a fabric the dimensional stability to be used as upholstery, and must be fire resistant. Many of these chemicals are types that have been proven to be harmful, and to be bio-accumulative. This means that increased exposure leads to increased levels of these chemicals in your body. If a product has a suspected risk of harm to the public or the environment, it is sensible to eliminate exposure to that product until further scientific findings emerge that provide sound evidence that no harm will result. Simply stated, if it might have a health effect, don't expose yourself, until it has been PROVEN that there is no effect. This is the approach to chemical regulation used by the EU. Unfortunately, the US system allows chemicals to be used until research proves there is some reason to regulate use of that chemical.Ok, enough bad news. The good news, and the reason I love the opportunity to answer these questions, is that knowledge is power. It is easy and important that you ask a fabric supplier whether their fabric is GOTS certified, and there are many sources of fabrics that are. Green fabric lines should know whether they are certified, and this independently verified standard is your strongest tool in evaluating whether a fabric is truly safe and chemical free. Each person can assess the risk, relative to their level of concern and take the steps to minimize their exposure that they feel are necessary.We have discussed mostly cotton, but there are beautiful fabrics in every market sector. 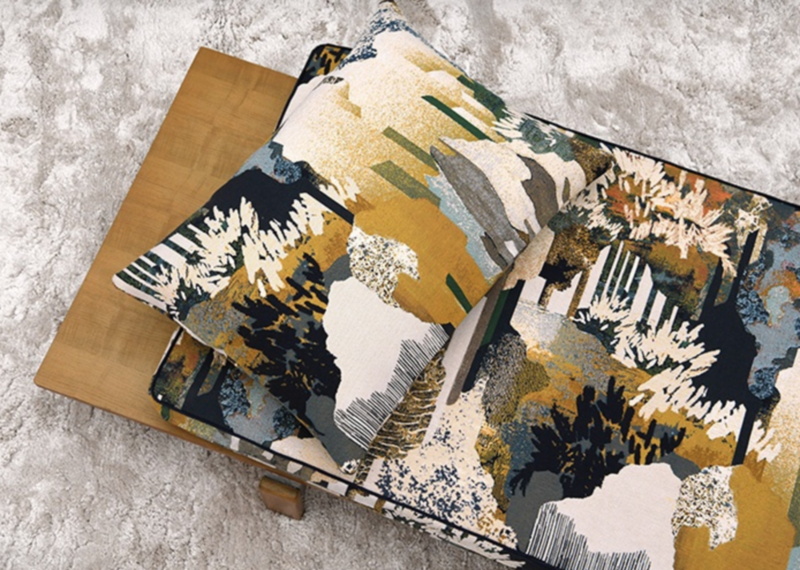 I love the O Ecotextiles upholstery and drapery fabrics, the lush wovens of Twill Textiles Climatex collection, and the groovy prints of Mod Green Pod. Every time you vote with your dollars by purchasing clean fabrics, you are creating change in the marketplace. Companies produce things that sell well, and now we have the knowledge that allows us to buy only safe fabric. One of the most positive things I have see in my years of researching green materials for interiors, is that increasingly mainstream manufacturers feel that they must have a green story to compete. 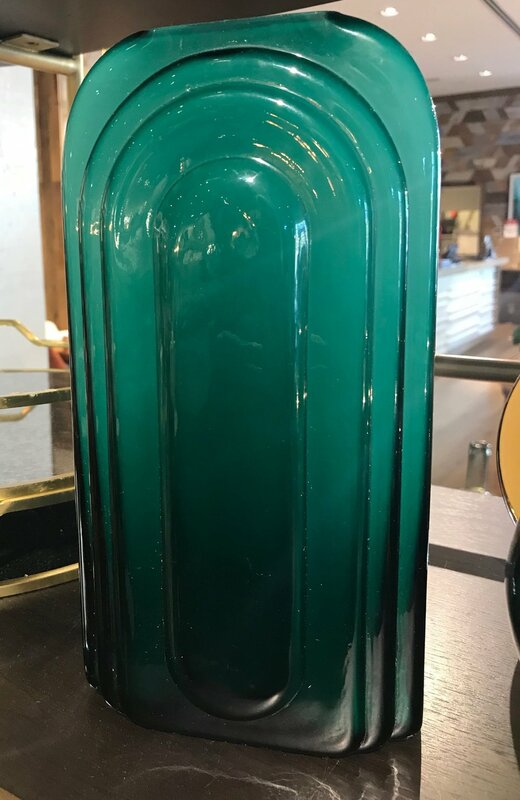 It used to be that green counter top materials were made by small producers such as Vetrazzo or Paperstone, who just wanted to do the right thing. Now the big manufacturers are putting out green countertops products. One of the great things about this is that it offers the consumers some options that are easy to order, and have a reasonable price. I like quartz based countertops anyway. Many consumers know them by their trade names: Zodiaq, or CeasarStone. They are green because they are low maintenance, low emitting, durable, replace a product that would have to be mined, and are made of one of the most plentiful minerals on earth. Now many of the manufacturers of Quartz countertops are creating products with recycled content. Constantino has made a separate line of green countertops, called ECO. The eco line is made of 75% recycled content including glass, mirrors, porcelain and stone scrap. My favorite is White Diamond, and I must admit I am not a huge fan of the ones with the mirror fragments. They are just too sparkly. In Ceasar Stone I love the Smokey Ash, it is a warm black that I would love to use in a kitchen. That particular product is 15% recycled, but the their recycled colors range up to 40%. Zodiaq also makes a line of recycled content solid surface countertops. Their color range is just lovely, and functional. I love Flax,but it is well worth checking out their whole color range. Slabs for countertops are heavy things, so one of the things you should think about is where a product is manufactured, and how it is shipped. Ocean Freight has one of the lower carbon emissions per ton, and so slabs that are shipped directly to a port, then stocked there, have a pretty low carbon footprint. Ceasar Stone is made in Israel, Constantino is made in Spain, and both are shipped to the port close to where it will be used. Zodiac is made in Canada, more local, but shipped via truck which is higher carbon per ton per mile. So if you live near Canada, Zodiac would have the lower carbon footprint, and if you live near a sea port, or in the EU, you might choose one of the other two. I do feel that it is worth mentioning one other choice. Cabria quartz surfaces do not have a recycled content. However they are made in North America, of N. American quartz, and thus neither the materials or the finished product have to travel far if you are in USA or Canada. The #1 reason why having a budget will be good for your project- It will be greener. People are surprised when I say I love working within a tight budget in a project. I truly believe it improves the resulting design. And one of the ways that it does so is by making the project greener. Interestingly enough, the reasons that support this statement are almost duplicates of the reasons below. If you think carefully about your project, and spend your limited budget on those features that truly matter to you, (as in reason #3 below) you are likely to create a space that will make you happy for a long time. One of the most important characteristics of a green project is whether it has longevity. It you like, and can live with a design for a long time, you are unlikely to remodel again in the short term. This minimizes how often you will need to consume more products, and throw away old ones, because you are tired of a room design. I also think that when you have been creative with reuse in finishing your design space, (as in reason #2 below) the resulting project is more that just visual. It also has a great story which resonates beyond the way it looks. “Remember how we found that chair by the side of the road, and had it refinished?” “Did you know that marble used to be on countertop in a bank?” These stories add richness and meaning to a space, in addition to being both creative and green. Also many of the most creative new materials in architecture and design are green. Most of the market is stagnant, and is not innovating. But green design is lively and stimulating, even in this down economy. New green products are being introduced contstantly and they are interesting, stunningly beautiful and exciting. 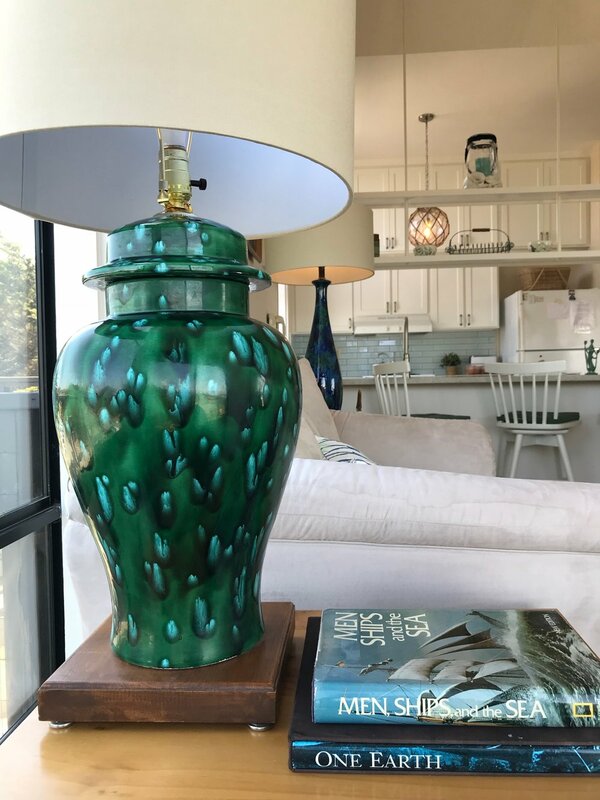 It is easy to select them just because or their visual qualities, but they also add a green story to the mix, “That tile used to be a car windshield!” Carefully selecting the new green materials and furnishings allow me to do design that feels fresh and interesting. And, finally, as I have said before; size does matter in green design. If you have a budget, you are likely to select the smallest possible scope of work. This means you will focus on making those changes that will truly make you space more functional and enjoyable. This targeted approach will benefit you the most, with the smallest investment. It will also use less natural resources, and create less waste. So the greenest project is the one that has a small (but realistic) budget. Read on to the older blogs to see the other reasons that a limited budget is a GOOD thing for your interior design project! #2- You will be more creative! 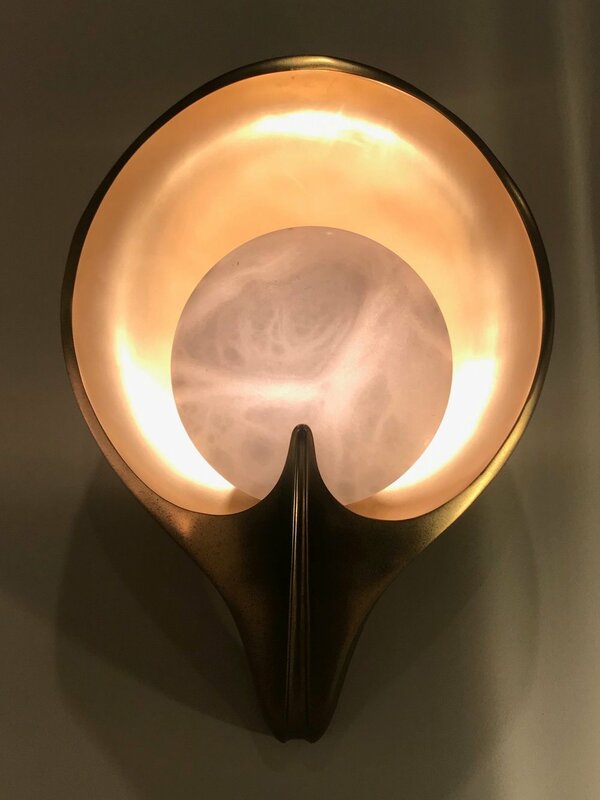 When you buy expensive products for your home, everything is beautiful because a staff of designers has done a wonderful job creating that item. I love high end design, but think that it is fun to take some of the creativity back from those designers. After all why should they get all the fun? You budget forces you to purchase expensive products sparingly, which frees you up to do creative problem solving. I use wallpaper on plaster walls in older homes, because it is so difficult to keep cracks from showing up as the house shifts (especially in earthquake country) but it can be expensive, $80-120 a roll, is not unusual. How about this idea, using old newspaper or pages from a book? Selecting a used addition of a favorite novel would add a layer of personal meaning to your walls. Even on high end projects I always use vintage pieces of furniture, they add additional charm. But expecially for wood items like end tables, or dressers, they represent significant savings over buying new, and are always higher quality than new items of the same price. I love selecting an item that reminds a client of a special time in their life, lunch in grandma’s kitchen might be evoked by a vintage painted table, or their groovy professor’s house by a mid century end table ($85 on craigslist). So, by paying attention to a budget, a bunch of creative options come into view for creating a more personal space. Wood pieces are easy to refinish, and vintage shapes add a unique touch to a home. If you have a Craigslist organization locally, that is a great place to look, and the best bargains are always at tag sales. Over all, having limits on your budget gives you the freedom to think creatively about your design direction. Solutions are not just handed to you (for a price,) it takes work. But once you start thinking creatively you will end up with a design solutions that are more personal, more fun, and save you money. If you have ever asked yourself, as I have frequently, “how the heck can I pick the best performing and most water efficient toilet?” help is at hand. What??!?!? You have never asked yourself that? You have never given it a bit of thought? Well, then I am a bigger eco geek than you, because I got all excited and HAD to blog today when I found this guide. It is a independent test of all of the low flush WC’s, or at least a place where you can download all of the tests and reports. It is test data divided into single flush gravity fed, single flush pressure assist, and dual flush, so you can download the testing for the kind of toilet you want to get. The research is sponsored by Canadian government agencies, and water conservation agencies and water utilties from the states. This means the testing and results are free of industry influence. Apparently the results are accurate due to the fact that “A soybean paste having similar physical properties (density, moisture content) to human waste was used in combination with toilet paper as the test media.” (Some one did that research, and then wrote that wonderful line as part of their report, I love scientists!!) It is so good to have real data to help you in making such an important decision!! And when you replace your old water waster, don’t forget to recycle it, it could be made intoa solid surface countertop, and they are actually pretty nice! Reports are starting to come back from Neo Con, a design industry trade show featuring new products primarily for commercial design. I love commercial design products for a number of reasons: first, they are durable since they are made to hold up in banks, offices and hospitals. Secondly, OSHA has standards for indoor air quality that apply in the workplace, so products made for offices must be low emitting. These standards do not relate to the home, so I have to research the VOCs for every home product I specify. And finally, partly because interior designers are working to achieve LEED points, there are a lot of recycled content fabrics, and fabrics with other eco qualities. I was impressed by this series from Brentano. It is made of wool, but it is significant how completely they have scrutinized the wool manufacturing process. They even made sure that the soap used to wash the wool prior to weaving was biodegradable! Plus it is a pretty, useful stripe that comes in a variety of colorways. Stripes are so great for pulling a room together- they add a little bit of pattern without dominating. I also enjoyed seeing this fun two tone floral from Carnegie. It is made of 100% POST CONSUMER recycled polyester, and is part of a very attractive Bright Side collection of fabrics. I could see the Whimsey floral, shown here, in a retro sun-room inspired setting, and the polyester would perfom well in there. If the bright + white is a little bold for you, how about the nice multi color floral, called Imagine? It is also recycled Poly, and comes in a variety of quieter colorways. I like the slight orientalist feeling of the pattern, it could go modern, or traditional. I love being able to offer clients a variety of sustainable choices in fabrics, and the product development is going very quickly these days. So nice to not be limited to organic unbleached cotton! Who knows stuff? Evaluating green building professionals. I am very excited that I have just passed my LEED Green Associate exam. But, I realize that this is only exciting news if you know what the heck it means. As in any profession, there are any number of alphabet letters one can put after one's name. Some mean more than others. If a homeowner is planning to hire someone to work on their home, it is good to know what the letters mean. The exam I passed is the first qualifying level for green professionals administrated by the USGBC. The USGBC is an agency that has the goal of promoting energy and resource efficient and healthy buildings. To achieve that goal they have created a building program called LEED (Leadership in Energy and Environmental Design.) A building, of almost any type, can be LEED certified, and a building professional can be LEED accredited. Different LEED building evaluation tools are available for different types of buildings: LEED Commercial Interiors, LEED for Homes, LEED Green Building Design and Construction, and a product for the Green Operations and Maintenance of existing buildings. Similarly architects, designers and builders can be credentialed in different areas. My goal is to be a LEED Accredited Professional in the LEED for Homes product. I first had to pass the LEED green associate exam. So if you are hiring, the LEED AP is someone who has shown high level of knowledge of a specific LEED area, and a LEED GA is someone who has the basic knowledge. One cannot take the LEED AP exam in a specific area until you have worked on a LEED project, so I cannot take the Homes exam, yet! LEED is a very tough rating plan, the training is very specific and challenging, and it does not apply to some building types. There is a cost to track all of the green characteristics of the project, although there is also a marketing premium to having a LEED building. There is another organization in California, that has as a goal developing a more accessible rating and training system: Build it Green. Both of these organizations have qualities in common: they both train architects, designers and builders on green building, they both educate the public on the benefits of green building, and they both have building rating systems. They work closely together to create training and rating systems for all parts of the building industry. The buildings rated by Build it Green are called Green Point Rated, and the buiding professionals that have been through the trainings are either Certified Green Building Professionals (CGBP) or Green Point Raters. I am also a CGBP, and look forward to being an Advanced CGBP at some point. Green point raters have the job of going out and evaluating a building to see if it qualifies under Build it Green's green building standards. I realize that this seems like an Alphabet soup of possible letters that a person could have on their business card. The bottom line is that if you are hiring someone, especially in the new field of green building, it is helpful to know that their level of commitment to green building matches your goals for your project. At minimum it is nice to know that they have the appropriate qualification listed above. It also is helpful to ask a professional how long they have been working in this field. Some have only started marketing themselves as 'green' recently once it became more popular. If you are strongly committed to lightening the environmental footprint of your project, it is good to pick a design professional that shares that level of interest, and had been exploring this field for a long time.